Does systematic self-deleting need to be prevented? This case (and other similar recent ones) makes me think something must be done about users systematically both deleting their questions after they've received a satisfactory answer, and deleting and re-posting questions to gain more attention. makes it impossible for potential answerers to check the asker's history - is this their first "write my code for me" type question, or the 25th? While not actively damaging the community as such, and probably occurring relatively rarely, this is really, really low behaviour, and extremely unfair towards those who take the time to answer. Does this need to be addressed somehow? This already happens, though -- if a question has sufficient answers and/or votes, the question owner is prevented from deleting it. Anything else, you must vote to delete and/or flag for mod attention, and attempting to delete will tell you that. I think, the moment a question has an answer, its not entirely the property of the owner. So the single vote delete should be disabled. I've seen similar behavior a few times, except with questioners editing gibberish into the question instead of outright deleting it. I consider this vandalism, and roll back such edits when I see them, but geez -- WHY WOULD YOU DO THAT?! I really don't get it! The outright deletions could be considered even more pernicious, since they're less obvious. Maybe the fact that a question was deleted (if not the actual deleted content) should remain visible in the user's publicly viewable activity, as a deterrent to the rude behavior Pekka is describing, while still permitting a way to save face if a user suddenly experiences "poster's remorse" and wants to retract a poor question. As Jeff notes, the system already prevents easy deletion of questions with valuable answers. 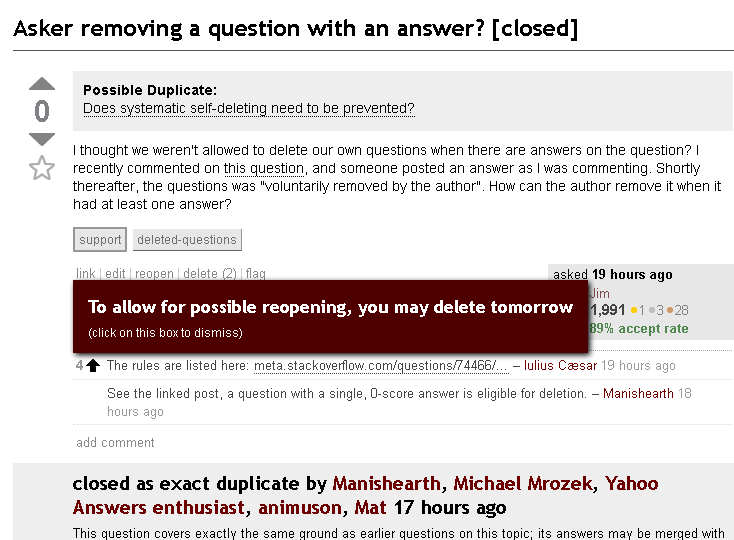 There's an argument to be made that users should be able to delete their own poor questions if they so desire, even if answers have been posted - there are plenty of examples of users who ask a question only to realize shortly afterward that their problem was caused by a simple mistake elsewhere (thus invalidating both the question and its answers). This, as Jim notes, could be fixed: let other users (perhaps 10K+ users) see recently-deleted posts in other users' profiles. Moderators, able to see all deleted posts, could then check for a history of this behavior and take the proper action. Not the answer you're looking for? Browse other questions tagged discussion status-completed deleted-questions abuse . Should self-answered “It was something stupid I was doing” questions be deleted? Should I avoid deleting my questions?